All you need to know about this new disease called "Meningitis." Meningitis is an inflammation (swelling) of the protective membranes covering the brain and spinal cord known as the meninges. This inflammation is usually caused by an infection of the fluid surrounding the brain and spinal cord.Meningitis is usually caused by bacteria or viruses, but can be a result of injury, cancer, or certain drugs.It is important to know the specific cause of meningitis because the treatment differs depending on the cause. Meningitis caused by bacteria, like Streptococcus pneumoniae, group B Streptococcus, and Neisseria meningitidis can be life threatening and requires immediate medical attention. Vaccines are available to help protect against some kinds of bacterial meningitis. 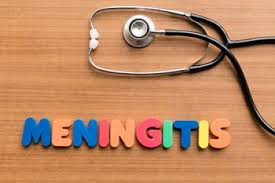 Meningitis caused by viruses, like enteroviruses, arboviruses and herpes simplex viruses, is serious but often is less severe than bacterial meningitis, and people with normal immune systems usually get better on their own. There are vaccines to prevent some kinds of viral meningitis. Various parasites can cause meningitis or can affect the brain or nervous system in other ways. Overall, parasitic meningitis is much less common than viral and bacterial meningitis. Primary amebic meningoencephalitis (PAM) is a rare and devastating infection of the brain that is caused by a free-living microscopic ameba called Naegleria fowleri which is found naturally in warm water and soil. Sometimes meningitis is not spread from person to person, but is instead caused by cancers, systemic lupus erythematosus (lupus), certain drugs, head injury, and brain surgery. Bacterial meningitis is spread from person to person. The bacteria are spread by exchanging respiratory and throat secretions (saliva or spit) during close (for example, coughing or kissing) or lengthy contact, especially if living in the same household. If you have close contact with a person who has viral meningitis, you may become infected with the virus that made the person sick. However, you are probably not likely to develop meningitis from the illness. That’s because only a small number of people who get infected with the viruses that cause meningitis will actually develop meningitis. Pregnancy. Pregnancy increases the risk of listeriosis — an infection caused by listeria bacteria, which also may cause meningitis. Listeriosis increases the risk of miscarriage, stillbirth and premature delivery. Compromised immune system. AIDS, alcoholism, diabetes, use of immunosuppressant drugs and other factors that affect your immune system also make you more susceptible to meningitis. Having your spleen removed also increases your risk, and patients without a spleen should get vaccinated to minimize that risk. 0 on: "All you need to know about this new disease called "Meningitis.""